Now our Carbonless Continuous Paper as well as NCR paper sheet has been exported to many countries, such as Zimbabwe, Mozambique, Saudi Arabia, Singapore, Mexico, etc. Contact us now if you have any question. Used for dot matrix receipt print machine with ink ribbon, widely used in bank, hotels, government, etc. 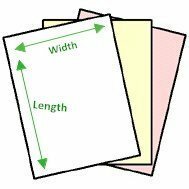 How to Measure Carbonless Paper Sheet Size? We currently accept T/T, Paypal and Western Union. Please contact us if you have any questions on shipping or payment, we will be happy to assist you.